One of the most beautiful spots in the island !! Charming apartment/studio for two persons in a newly renovated "Finca" in the north of the island. Private entrance, equipped kitchen and bathroom , large pool , chill-out and terraces & Wifi . 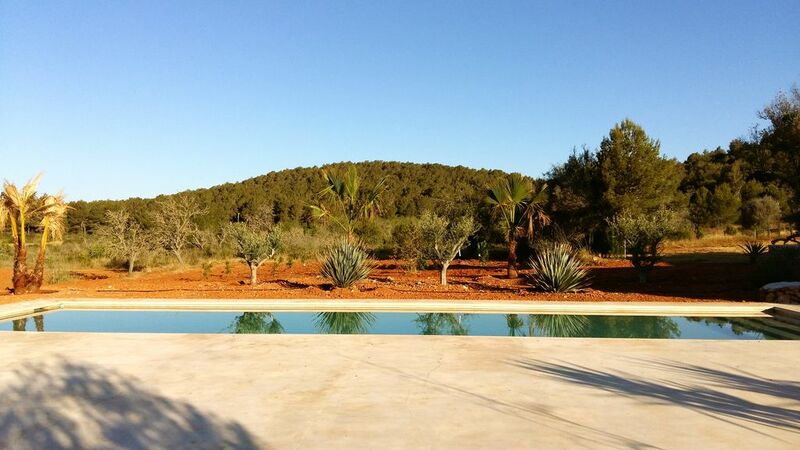 Access to a gorgeous and large swimming pool (14x4m), terraces and chill out area . Beautiful 360° country views and vegetation, privacy and tranquility at a quick drive from San Mateo, San Miquel and Santa Gertrudis, as well as Benirras beach, puerto de San Miquel, and 15 minutes from Ibiza town. We expect you to enjoy your stay with us to the fullest, making sure that you'll be provided with all of the modern amenities and supplies necessary for a wonderful stay. Owners on premices . Pool and exterior areas to share . If you need any more information please let me know, I will be glad to help you in the best way possible. We had the most amazing experience at the House on Ibiza. was cozy, well appointed, and just an amazing feel to the place. Good Vibes..!! I wish we could have stayed longer.... The Best Time.!!!! We ' re so happy you enjoyed your stay . It was a real pleasure having you here ! Welcome back anytime . Beautiful and stylish little gem! We had great stay at Stephane and Aline's beautiful and peaceful home during our family holiday, it was so important for us to have a great place to stay with our little 20 month old child, the overall area is one of the best in Ibiza, completely distance from the usual hustle bustle yet near enough to go to the best beaches and restaurants. We were also pleased to have little B playing with their kids to have some interaction. Thank you for such a wonderful hosts and we highly recommend your beautiful home! An amazing house with great surroundings. A car is absolutely necessary and thank you Stephane for pointing that out, it was really helpful. To hang out at the pool, enjoy the sunset and gaze the stars, this place is what you need when you are not partying in Ibiza. An intimate space for two with all you need for a pleasant stay. We will surely return if possible and do highly recommend this place for two! Very nice and respectful guests. To recommend. We spent a week in Stephane´s place in late October and had a wonderful time. The place is well-located and easy to find following the instructions sent by Stephane via email shortly before our vacation there. The place is well equipped with a small kitchen, but lacks a place to sit down inside in case of bad weather. It is only suited if you intend to spend all time exploring the island. The shared terrace and pool are simply astonishing and offer a great view of the surrounding nature. Curato e originale. Solo un po' piccolo per un soggiorno lungo.